Fr. Matt was born and raised in Klamath Falls, Oregon. After high school, he spent 5 years in full-time youth ministry work, 2 of those traveling around the US and Canada putting on retreats for young people with Reach Youth Ministry. Father entered Mt. Angel Seminary for the Archdiocese of Portland in 2004. He received a BA in philosophy at Mt. Angel Seminary in 2007, STB degree at the Angelicum University in 2010 and STL at the St. John Paul II Institute in 2013. During that time, Fr. Matt served at nursing homes and parishes in Oregon, worked with the Missionaries of Charity in Rome and NSA Naples Navy Base in Naples, as well as a pastoral internship year at St. Paul Parish in Eugene, Oregon. He was named parochial vicar at St. Juan Diego Parish in Portland, and after obtaining his STL degree, and then was assigned by Archbishop Alexander Sample as administrator at St. Rose of Lima Parish and Archbishop Howard School in July 2013. Fr. 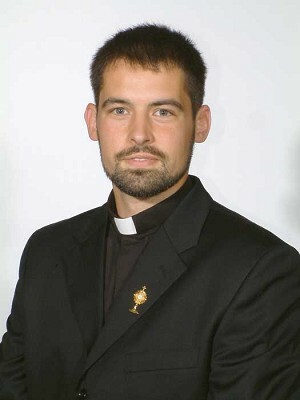 Matt was ordained a priest by Archbishop John Vlazny on June 9, 2012.